Kev Marcus and Wil B can do more with two string instruments than what most of today's artists can accomplish with an entire catalog. Soon after the pair met during high school in FL, Kev Marcus (Kevin Sylvester) and Wil B (Wilner Baptiste) combined their individual gifts into an energetically eclectic musical approach, grafting together influences from genres like rock, pop, soul and hip-hop to express their artistry. After landing on the national radar in 2004 during a Billboard Awards performance with Alicia Keys, Black Violin built up their following with a self-titled 2008 debut and their competent 2012 follow-up, Classically Trained. Stereotypes, their latest release, continues their exploring approach but adds bolder, broader strokes with forays into hip-hop, blaxploitation-era soul and edgier, modern interpretations of jazz. If the title gives listeners the impression that the duo is escaping the safer confines of their previous releases, they're right: the pace is livelier, the tracks are more percussive and the guest performances add more strength as well as star power. Robert Glasper adds his piano prowess to the saucy mid-tempo, "Stay Clear," while Melonie Fiona pours on the bittersweet with 'Illadelph' native and hip-hop icon Black Thought (The Roots) on the pulsating "Send Me A Sign." Another rhyming vet, Pharoahe Monch, injects blistering social within "Invisible," the frenetic flow only equaled by Wil's and Kev's fiery duel of the strings. The entire collection seems to be, as a sign of the times, led by and dominated with moments of turmoil, personal or otherwise: The Chi-Town vibe and battling, piston-paced violins in "Running" could be the soundtrack of a morning jog or signify the never-ending rat race to survive, depending on the listener's present mood, while "Addiction" and "Losing Control" sound exactly like what they are - the unhinged and frantic emotions of a man who feels led by his craving of a woman who is either out of his grasp (the former) or leading his heart into places from which he may not be able to escape (the latter). Whether it's a re-configured take on an Isaac Hayes classic ("Walk On By"), lovelorn grooves ("One More Chance"), a raw racial commentary set to music (the title track) or a sweet soliloquy about a new love ("Magic"), Wil B and Kev bring inventiveness and enthusiasm to an often-redundant template of sounds. 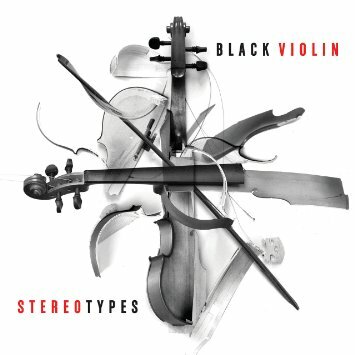 Stereotypes not only eclipses its title, but any prior expectations of Black Violin. As its popularity continues to expand, the duo charges up its creativity and range to new and very promising levels. Highly Recommended.